Positive Detroit: Don't Miss Detroit4Detroit's Crank Up the Cause, Thursday May 17th! Tashmoo Biergarten is Baaaack This Weekend! Whole Foods Detroit Groundbreaking This Monday! 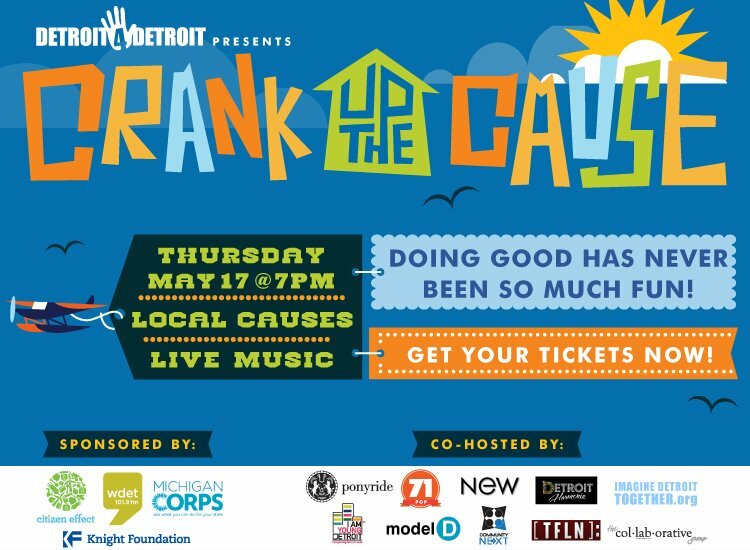 Don't Miss Detroit4Detroit's Crank Up the Cause, Thursday May 17th! On Thursday, May 17th 2012, Detroit4Detroit will host Crank Up the Cause at Bert’s Warehouse (2739 Russell St) from 6:00 PM – 10:00 PM. In partnership, event sponsor WDET is giving away $50,000 in free on-air promotions to Detroit4Detroit nonprofit community partners through their Vote For a Cause campaign. Through May 13th, supporters can vote for their favorite Detroit4Detroit nonprofit to receive the first $25,000 of promotions by visiting WDET.org. The voting will culminate at Crank Up the Cause on May 17th, where attendees can cast their vote for the 2nd $25,000 up for grabs. Detroit4Detroit’s Crank Up the Cause is an event to celebrate local nonprofit organizations and the ordinary citizens doing extraordinary things to support them by leading a Detroit4Detroit project. Crank Up the Cause will have great local music, food, and fun. But the people and community groups doing good are center stage. Tickets are $10, but that $10 is actually a donation and a WDET vote that the partygoer will give to one of the 20 nonprofits at the event. Attendees can support the following nonprofits — ACCESS, Brightmoor Alliance, COTS, DAPCEP, DRMM, Georgia Street Conservatory, Roosevelt Park, SER Metro Detroit, Summer in the City, The Empowerment Plan, Vanguard CDC, and Wellspring. Several more will be announced shortly. Crank Up the Cause is co-hosted by WDET, Michigan Corps, 71 POP, Community Next, Detroit Harmonie, I Am Young Detroit, Imagine Detroit Together, Model D, NEW (Nonprofit Enterprise at Work), Ponyride and Texts From Last Night and The Collaborative Group. Tickets are immediately available at www.CUTCDetroit.eventbrite.com. To learn more about sponsoring Detroit4Detroit’s Crank Up the Cause contact Julia Troupe, 313.918.7827, jtroupe.events@yahoo.com. For more information on Detroit4Detroit, please see recent articles in Model D and the Huffington Post Detroit, or at www.Detroit4Detroit.org.